GO-FIND detectors require no assembly, collapse to a small size for transport, and are very lightweight. 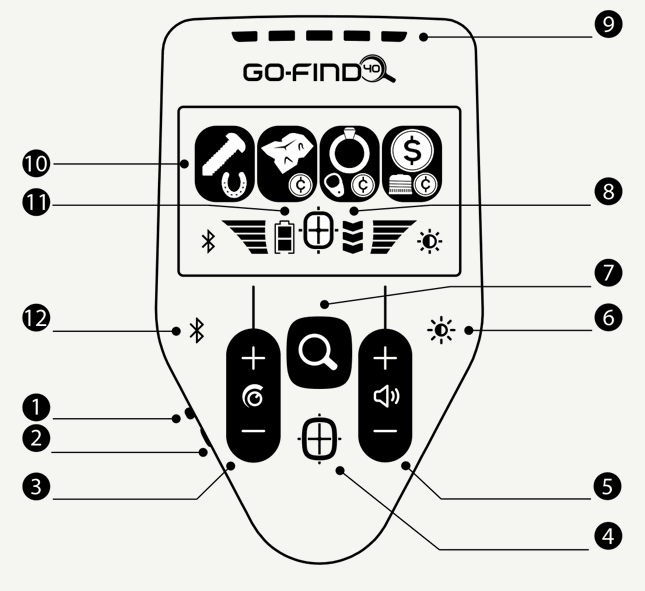 The GO-FIND 40 and 60 have Treasure View LED indicators to show possible trash & possible treasure finds, and also Bluetooth integration to work with Minelab’s GO-FIND apps that have Coin ID and Google Maps capability. Pack a GO-FIND for your next outdoor adventure. When a metal object is detected, the corresponding icon will flash on the control panel to indicate the target type. If the icon is turned off (not visible) then these object types will not be detected. 1) POWER SWITCH (ON/OFF) 2) EAR BUDS OUTPUT 3) SENSITIVITY Increase for more detecting depth. You may need to decrease this if there is high noise interference or false signals. 4) PINPOINT (GO‑FIND 40/60 only) Determine the exact location of a target. 5) VOLUME 6) BACKLIGHT (GO‑FIND 40/60 only) 7) FIND MODE Detect and reject metal objects. 8) DEPTH INDICATION Shallow | Medium | Deep 9) TREASURE VIEW LED Red and green LEDs help you quickly identify treasure from trash. (GO‑FIND 40/60 only) 10) FIND ICONS (x 4) 11) BATTERY LEVEL 12) BLUETOOTH (GO‑FIND 40/60 only) AUDIO OUTPUT 1/8″ connector with speaker at rear. LOW TONE: Iron targets (such as nails) produce the lowest tone. MID 1 TONE (GO‑FIND 40/60 ONLY): Less valuable metals produce a lower medium tone. MID 2 TONE (GO‑FIND 60 ONLY): Higher value metals produce a higher medium tone. HIGH TONE: Silver and copper targets produce the highest tone.